In our next band spotlight, we chat to Filharmonix! S] What inspires your band – think about people and places? As far as our songs and sound goes, we take inspiration from the social beings around us…for example our song Heavy-metal Cowboys is about the rebel mind that people talk about, like they want to break free and do stuff on their terms, and enjoy life. Then again we wrote our our song U’d Look Hot when one day we overheard few guys in a bar, they were watching the TV and were gossiping about how hot those models would look without the little clothes. Then our song, Ana inside was about heartbroken guys, it stayed on Banglore rock chart at no.4 for one month. Love machine was about guys who enjoy 1 night stands..so it’s like we draw our inspiration from almost every thing around us..
S] What about musically, which musicians are your main inspirations? We are mostly inspired by 80s rock and metal scene that took over the world..as for personal choices we have certain bands and musicians for inspiration in common like Deep purple, poison,motley crue, Gnr, whitesnake, ozzy, judas priest and def leppard. 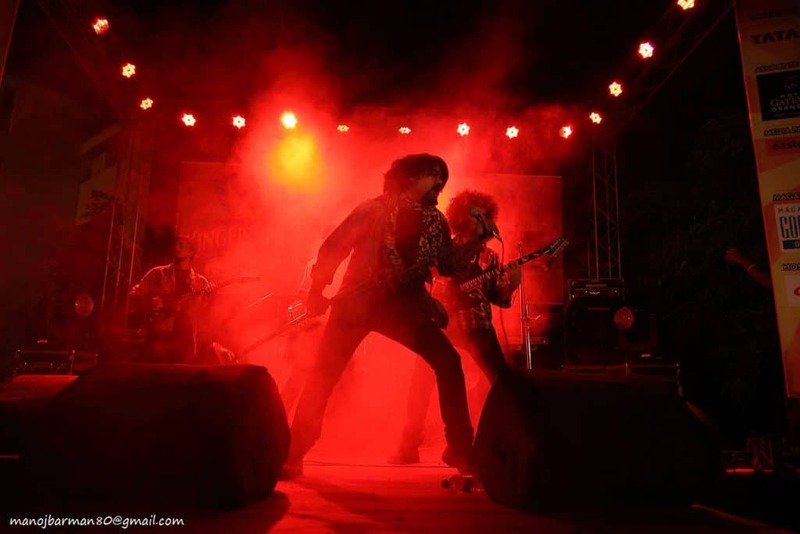 Anurag (guitarist) is a big devotee of Joe satriani, Dough ulrich ,Vitto Brata & Slash. KK simply loves Paul gilbert, Eddie Van halen & Nuno bettencourt. Ved (bassist) loves the playing style of Gene simmons & Billy sheehan.While our drummer Sami loves Ian paice,alex van halen,Tommy lee,late nick manza,vinnie paul..And I love David lee roth,david coverdale, bonn scott,axl rose,sabastian bach, joe elliott. S] What are your big plans for the rest of the year? Currently we are working on our new single “Bed Toy” and an unnamed power ballad..then we have plans of a new song and a video in regional language (assamese) to promote Rock n Roll in Assam. S] What would you like to say to UK fans?